BMW 1 series, the first ever hatchback in the BMW portfolio has arrived in the lucrative Indian car market with an affordable price tag. This new hatch is going to be an ideal vehicle for those young generation customers, who prefer a “BMW” badge on their car and can't really afford to a bomb for buying a luxury saloon. 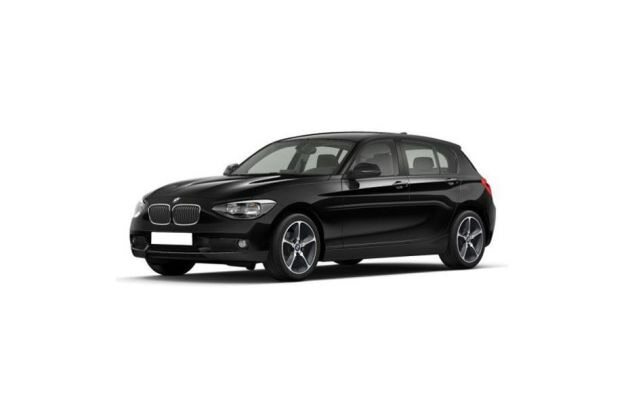 The company introduced this hatchback with both petrol and diesel engine options out of which, BMW 1 Series 116i is the petrol trim that comes with a very attractive price tag. The company introduced this new four wheeler in the premium hatchback segment of the country's car market, where it will compete with the newly launched Mercedes A Class hatchback series. This petrol trim is powered by a turbocharged 1.6-litre, 4 cylinder based TwinPower turbo petrol mill that has the displacement capacity of about 1598cc, which is rather powerful. This premium hatchback from BMW comes with a total length of about 4324mm along with an overall width of about 1765mm that ensures ample space inside the cabin. The company has bestowed this premium hatchback with top end comfort and convenience aspects that are mostly used for top end luxury car models. With high quality features, a competitive price tag and a captivating body style, this BMW 1 Series will surely get the attention of young car enthusiasts in the country. When it comes to the exterior style and design, this newly launched BMW 1 Series comes with a exemplary BMW design that stole the hearts of numerous car aficionados across the global car markets. It looks small and compact compared to other BMW models, but it is as lengthy as a regular sedan and quite spacious as well. If we just take a close look at its front facade, you will find the iconic kidney bean shaped radiator grille, which is most common in all the other BMW car models as well. This stylish radiator grille has been given a lot of chrome treatment and it has been flanked by an aggressive eye shaped headlight cluster that houses radiant projector lamps and side turn indicators as well . Below this trendy radiator grille, there is the trimly styled bumper painted in body color, which also incorporates air ducts and a wide air dam, which helps in faster cooling of the turbocharged engine. Apart from this, the company has also bestowed a pair of round shaped fog lamps, which have been fitted on this curvy bumper. Then there is a chrome garnished horizontal strip that has been fitted to the air dam that makes the frontage look elegant. The side profile is very smooth and flowing with character lines. However, the company has blessed the neatly carved out wheel arches with a classy set of robust alloy wheels, which have been covered with sturdy tubeless radial tyres. The external wing mirrors have been integrated with side turn blinkers to further add style to this hatchback. The rear profile of this hatch is very sleek and it is dominated by a stylish tail light cluster that looks simple but at the same time looks very aristocratic. When it comes to the interior cabin section of this hatchback, the company has used finest quality materials inside the cabin for obtaining a rich finish inside. The steering wheel, gearshift knob and the seats are all covered in premium leather upholstery. The design of the dashboard is very stylish and it houses several comfort features as well as other utility aspects. The dashboard also incorporates sophisticated features like an advanced air conditioning system along with AC vents and an infotainment system with touchscreen display. This hatchback comes with an impressive wheelbase of about 2690mm, which is one of the reasons for ample space inside the cabin. There are several other exciting utility features incorporated inside the cabin that includes cup holders, electronic seat adjustment for standard seats, an advanced navigation system, extended connectivity for music player, iDrive touch controller on central console and many more advanced features. As far as the engine and its specifications are concerned, this BMW 1 Series 116i petrol trim has been equipped with a 1.6-litre TwinPower turbo petrol mill that has the displacement capacity of about 1598cc. This petrol power house has 4 cylinders and 16 valves that produces a maximum power of about 136bhp at 4400rpm and yields 220Nm of maximum torque output at 1350rpm, which is rather impressive. This engine has been coupled with an advanced eight speed automatic transmission gear box that transmits the power to the rear wheels of this hatch. This will enable 50:50 weight distribution, which will eventually improve the driving dynamics, performance and comfort of the occupants. The company claims that this petrol engine based hatchback can deliver a healthy mileage of 16.28 Kmpl, which has also been certified by the ARAI as well. Coming to the braking and handling aspects, this newly launched BMW 1 Series comes with an efficient braking system, which is further enhanced by other aspects as well. Both the front and rear wheels have been assembled with disc brakes, which functions in an effective manner with the help of an advanced anti-lock braking system and other efficient braking mechanisms. On the other hand, it comes with sturdy set of suspension mechanism that makes it easy to handle and control. Inside the cabin, the power steering system is very responsive and helps the driver to maneuver in heavy traffic with ease. This newly launched BMW 1 Series is a low cost hatchback from the esteemed stable of BMW. Although it is the most affordable car from the BMW model line up, it is bestowed with quite a number of amazing set of features like those which are generally offered in the high end cars. This hatchback from the German automaker has been offered with varied set of aspects, which include an auto start and stop function, sports leather steering wheel, comfortable seats, a proficient air conditioning system , a multi function power steering, all four power windows, an iDrive touch control, an advanced navigation system with integrated music player, USB, AUX-in and Bluetooth connectivity and many more such sophisticated functions. There is no doubt that the occupants inside the cabin will get to experience lavish luxury inside the cabin. The seats are well cushioned and wide, which will ensure an a relaxing experience like never before. BMW is known for developing innovating safety and security features for all its car models. This hatchback has also been bestowed with quite a few intelligent safety features that offers protection for both the car and to the occupants as well. There are air bags for the driver, front co-passenger along with side air bags for enhanced protection. Then this hatchback also has head air bags for front and rear, a connected drive service, a high beam assistant, dynamic stability control, a cornering brake control, a dynamic traction control, hill-start assist, a park distance control and various other advanced features, which will help the driver in handling this vehicle with ease. With such advanced features, this all new BMW 1 Series is surely going to be a highly acclaimed hatchback in the Indian automobile segment very soon. Pros: Sophisticated comfort and safety features, engine performance is very good, spacious interiors. Cons: Mileage can be made better, price tag can be more competitive.